Summer in Chicago is finally here, and we all need to be conscious of what the weather change can do to our vehicles. It's important to prepare your car or truck for the hot weather headed our way. This means going beyond a simple coolant check; doing a thorough car inspection can mean the difference between cruising comfortably down the highway, or being stuck on the shoulder with steam pouring from the engine. Don't let this happen to you! Follow these steps and you'll be in the clear. 1.) Cooling System - It's made up of coolant, the radiator, cooling fan, hoses and belts, water pump and heater core. Each of these items needs to be checked for leaks or other damage. One example is to check the radiator core for rot after a long winter of driving on salted roads. If left alone long enough in the heat, this rot will continue through the core piping and cause the coolant to leak out and the engine to overheat. And no one wants that. Every car's radiator should contain antifreeze, even in the long hot summer months. This is because antifreeze is full of corrosion inhibitors, and, antifreeze has a higher boiling point than water, which means it will keep the car's engine cooler longer than water. Have some extra antifreeze on-hand, just in case you need to fill it up. 2.) Tires - Check all four, including the spare. It is extremely important to ensure that your vehicle has the correct air pressure in all of your tires, especially when driving on hot pavement. You can find the recommended tire pressure for your car or truck on a sticker on the inside of the driver's side door, or in the owners manual given to you at the time you purchased the vehicle. Always fill to the recommended tire pressure, NOT the maximum. Also, make sure the tread is in good shape. The penny trick is the best way. Turn the penny upside down so that Abe Lincoln's head is inside the tire tread. If the tread is covering his head or reaches to the top of his hair, the tread is acceptable. If it's any lower, however, it's time to replace those tires. 3.) Oil Change - Be sure to get an oil change! Engines need plenty of lubricant when it's hot, and old oil becomes sticky and can clog the lines. Changing the oil every 3,000 miles is the norm, but if you'll be doing lots of summer driving, change it more often. DRIVE THE SPEED LIMIT: You may not get there as fast, but you'll save your engine a lot of heat. IF YOUR CAR IS OVER-HEATING: Crank up the heat! Turning the heat up on the inside of the car will draw heat away from the engine, cooling it enough to get you to some place safe. If the needle continues to plunge, stop driving the car and seek help. Following these summer driving tips can mean plenty of long and happy road trips for you and your automobile. Didn't pass your summer driving car inspection? Stop in to Titan Auto Sales, reference this blog post, and receive 10% off your service! It's that time of year again. The time of year characterized by cold wind, fluffy white snow, and lots of layers. 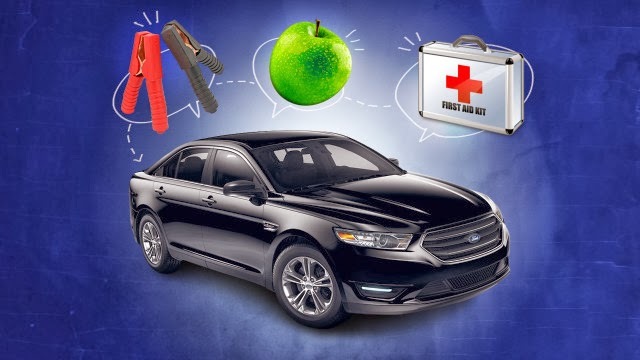 As the temperatures drop, Titan Auto is here to remind you that you NEED AN EMERGENCY KIT for your vehicle. It's important to get it done now; you never know just when it will come in handy. Read on for our list of Must-Haves. We all know that the cold can wreak havoc on our vehicles; it causes them to stall, freeze shut, or not even turn-over in the first place. It can be frustrating, and we understand the fact that when you are standing in freezing temperatures, already frozen to the bone and most likely late for work, anger can mount quickly. In order to help you through that dreaded "What do I do now?" situation, we've put together a list of ways to get that stubborn car to start. 1.) Coax the Engine. 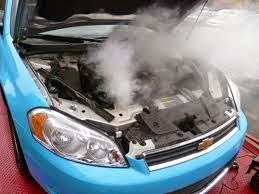 In engines with a carburetor - check your car's manual if you're unsure - gently push on the gas pedal while still parked. Press down once and then release. This will inject a small amount of fuel into the engine, which can help get things going. Please Note: there is no need to do this with fuel-injected engines.
. Be sure to close all the doors and turn off any interior lights. Shut off the radio, heater, and any other accessories that might draw power. This will give your engine it's best opportunity to start. 3.) Turn the Key and Hold for 20 Seconds. This helps the engine to start. Note: DO NOT hold for longer than 20 seconds; you don't want to cause any damage to the starter. If it does not work, be sure to wait a few minutes before you try again. 4.) Consult the Manual. You may not know it, but just about every car or truck manual has tips and suggestions on how to perform a cold-start. 5.) When all else Fails, Jump the Battery. If you've tried the previous steps, and still nothing happens, your battery may need to be jumped. Using jumper cables, jump-start the battery with the help of a running vehicle. A jump-box will work also. Remembering these 5 tips can save you a lot of headache and frustration. And when you simply can't get the 'old gal' started, you can always set up an appointment with our trained service professionals here at Titan Auto Sales. 1. Wash your vehicle every 10 days or less. 2. Wash your vehicle before the temperature reaches 35 degrees F. or higher. At freezing temperatures, road salt can't do much to hurt your car; it has to warm up to start contributing to rust. 3. Avoid driving through deep snow. Deep snow can become packed into the undercarriage and contribute to corrosion and even cause drivability problems (reduced braking action, vibrations, inhibit airflow, etc). 4. Avoid driving through large puddles of standing water where road salt collects. 5. Repair paint chips that are larger than the tip of a pen to avoid corrosion. 6. Wax your vehicle at least every three months to give your vehicle a strong protective coating. 7. Wax your vehicle before winter to protect your paint from corrosive salt. Most recent car-buyers appear to be on the same page regarding the need to maintain their vehicle's engine and internal workings. But what about the exterior? It is mostly common knowledge that in order to keep up the appearance of your vehicle, particularly the paint color, you need to be laying on a good coat of wax every now and again. But how often is needed, exactly? And can you wax too much? Read on for tips to determine how long you should wait between waxes. Generally, a Polish and Wax, or buff and wax, as it is sometimes called, is recommended once a year; it safely removes many contaminants on the vehicle’s paint surface like road tar, tree sap, and other materials that can harm your paint and clear coat. Now, if your car sees it's fair share of harsh conditions, like excess rain, dirt, salt or snow, you may need to wax your vehicle more often to ensure any damage being done to the paint surface is repaired, and to halt any long-term damage. It is important to keep in mind that the prior maintenance of your car's exterior can make a difference in how often you need to wax as well. A vehicle that has been cared for and waxed habitually will retain it's shine for longer, and you can go longer between waxes compared to a vehicle that is only run through the car wash monthly. Whether or not your vehicle resides in a garage is another factor. Those tucking the car in at night will decrease the environmental factors affecting the car's paint, therefore increasing times between waxing. Viewpoints differ depending on the level of expert, or do-it-yourself-er, you ask. Wax manufacturers typically recommend waxing more often than others, around once a month. If you happen to have the money and resources to spend getting your car waxed that often, than kudos. Just be sure that the wax used does NOT contain any cleaners or abrasives. If it's just a basic sealant wax with no cleaners, then there is really no such thing as waxing too often. The time you wait between waxes relies on a variety of factors. The best way to determine how long you should wait is by weighing all of these, and deciding a course of action. Then, tweak your process as needed, using trial and error. You can also use a simple water-bead test to determine if it's coming around time to lay on a coat of wax. Toss a bucket of water onto your vehicle, and monitor the water's behavior. If the water is beading up nicely, preferably no larger than about 1/2" diameter, than it appears your last wax job is still working for you. If you see the water run off in large puddles or sheets, than it is definitely time to bring it in.